I have presta valves on two of my bikes. I have a presta floor pump. I have an air compressor. I have a schrader adapter. I have a blowgun and a tire inflator for my compressor. I can attach the blowgun and the tire inflator to the presta valve using the schrader adapter. What I want to know is what kind of attachment do I need to screw my air compressor on to the presta valve after the core is removed? The schrader adapter screws onto the valve core, so without the valve core, none of my attachments fit. What do I need? This post indicates that people remove the valve core to get a high volume of air into the tire (which I want to do to seat my tubeless bead), but nowhere can I find exactly how to attach my air to the valve without the core installed. The only things I can find in videos that actually claim to do this are the Park Tool INF-2 Inflator and the Silca Hiro Locking Chuck, which exceed $150 CAD ($115 USD) and $90 CAD ($65 USD), respectively. Please help, I've wasted hours trying to get a solid answer to this question. Inflator heads with Presta fittings let you do this because they tend to (always?) seal down around the stem, not the core. I don't know any other way. I suppose you could also take a spare Presta core from a dead tube, break the plunger out of it to get more airflow, then temporarily install it in your tubeless valves and put your adapter on that. This is conjecture. If you haven't already, one thing you might try if seating the beads with your inflator head plus an adapter just isn't working is first install the tire with a tube, seat the bead that way, then break just one of the beads free and try to do the tubeless seating. This can make obstinate ones go pretty smooth. Use the same kind schrader-to-presta adapter you would use with the valve core, but tightly press it against the valve stem when inflating the tire. 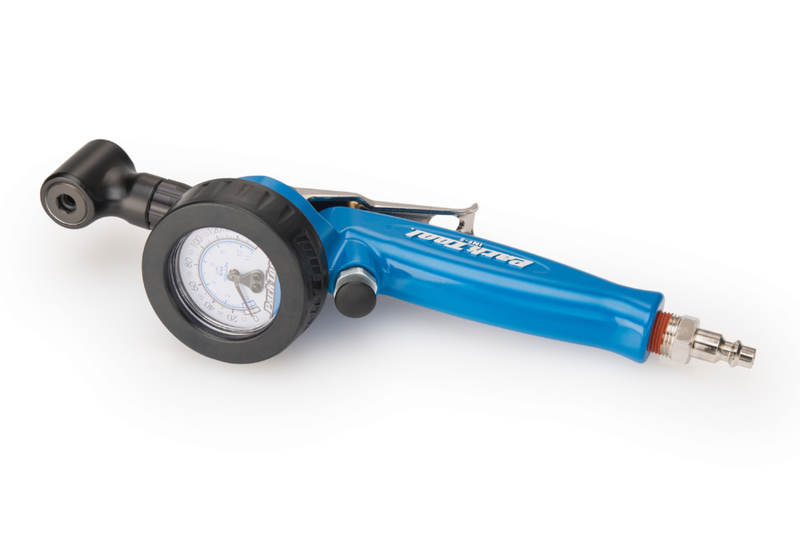 People indeed often remove the valve core when converting to tubeless, but inflating the tire without it doesn't necessarily require an airtight between the inflator hose and the valve stem. A minor leak most likely does not matter in the process of rapidly deploying large quantities of air in there, and the air doesn't need to stay in for long. You're only seating the tire beads to the rim and will later need to properly inflate the tire with the valve core in place anyways. Sit down on something and place the tip of your foot between the spokes, on the rim, on the opposite side of the valve. Gently push the rim downwards with your foot, but try not to squish it against the ground as it could create bigger leaks. With your other hand, operate the inflator. Not the answer you're looking for? Browse other questions tagged tire tubeless valves presta inflation or ask your own question. What are the benefits of removable presta valve cores? Why does my floor pump only fill a presta valve tire after a pop sound? How can I stop air leaks unscrewing a tire from compressor?